“Can you fire a 1-inch, 10-shot group at 100 yds. 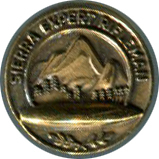 ?” Any shooter who can may qualify for a Sierra Expert Rifleman Award and be entitled to receive a bronze cap or lapel pin, a colorful Brassard, and a beautiful certificate for framing. In order to qualify shooters much use Sierra Bullets. Any shooting position and any make or caliber of rifle may be used, however, the weight of rifle and 6-power scope may not exceed 10 ½ lb. Awards close December 31, 1962. Every man, woman, and child in the United States is eligible. Everyone who qualifies will receive an award. Sierra Bullets is not limiting the number of awards. Shooters should get a free entry blank from their dealer before firing their group. An actual lapel pin from the display in the Sierra Bullets front lobby. 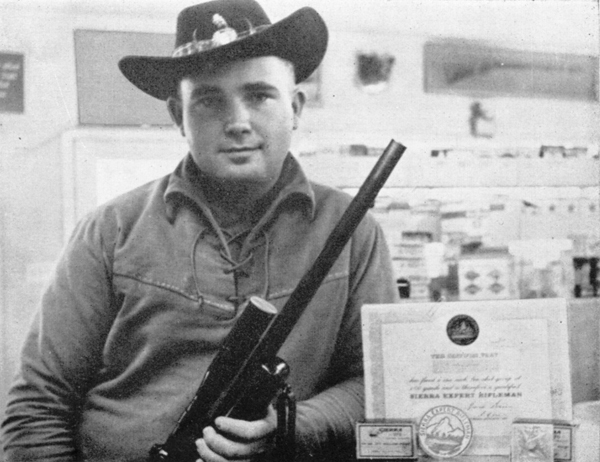 John H. Cuneo of Roseville, California, the first rifleman to quality for a Sierra Expert Rifleman award. To qualify, Mr. Cuneo fired a 10-shot group within 1 inch at 100 yards using 90 grain, .270 Hollow Point Sierra Bullets. The personal certificate, brassard, and pin presented to him are shown in this picture taken at Raymond Sporting Goods store in Placerville, California. This entry was posted in Competitive Shooting and tagged 1 inch group shot, 10 shot group, expert rifleman, shooting contest, Sierra Bullets rifleman, Sierra lapel pin, Sierra Rifle Award. Bookmark the permalink. Not bad for a 77 year old. I qualified at the age of 14 in 1962. My Grandfather had qualified for it before me, and we both used the same rifle. It was as a Remington Model 725 in .222 using Sierra 53 grain builets. I still have some of the targets from working up the loads. The rifle sits in my safe as I write this, and shoots just as well today as it did then.